The color for April will be purple. These beautiful hand dyed fabrics from Vicki Welsh make me think of irises and crocuses of spring. I used to look forward to them as the first sign of spring when we lived up north. Spring was a short weekend leading to swelter here in Florida, but I enjoy the thought of seasons if not the reality. So pull out ALL your purples. from lightest lavender, to darkest violet, let them all come out to play this month. 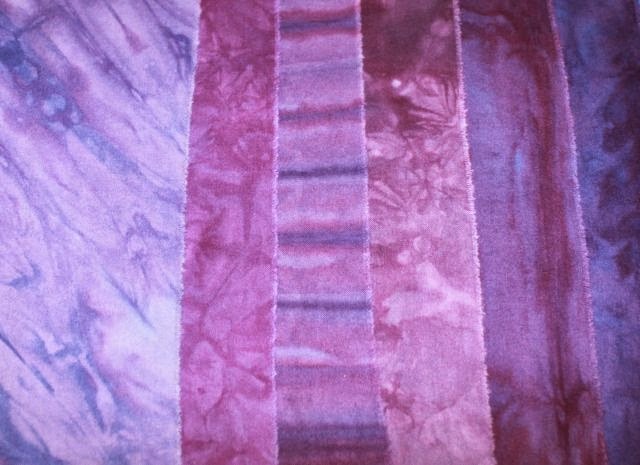 If you would like to be entered into the drawing to win this package of hand dyed fabrics, just leave a comment on this post. Just for fun, tell me the name and date of the last quilt you finished. I hope lots of yellow blocks are brightening up your design wall this morning. If not, there are still three more days left in March for you to polish off the last little bits. Use the linky below to share your bright and happy yellows with us all. Being home again after vacation is always so much fun! After the laundry of course. My dining room table has been full of Lego Robotics since September. Not that legos aren't fun, but tables are good for other things too. So between loads of laundry, I moved the robotics board out, and replaced it with -- gasp -- dishes. Shocking, right? Then I pulled out the strings and started to get a feel for what they will look like together. 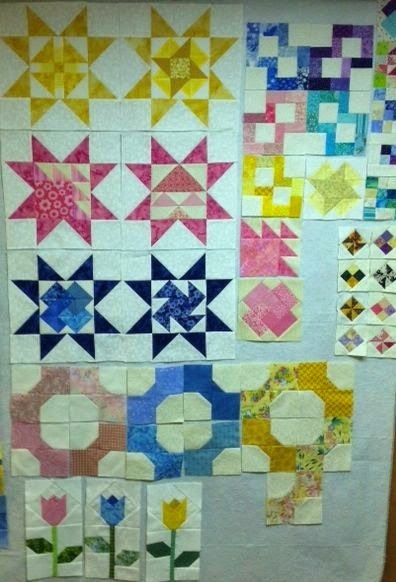 These are all sewn together into groups of 4. Not sure of the layout after that. Though I like the idea of a row of each color, I'm not sure I have equal amounts of strings in all the colors. Time will tell though. I got the sweetest e-mail from Dot last night. She read about the Rainbow Scrap Challenge last year too late to join in. She has been sewing along this year though, with enthusiasm. Because she doesn't have a blog, she sent me these pictures to share with you. Those big lovers knots look great. 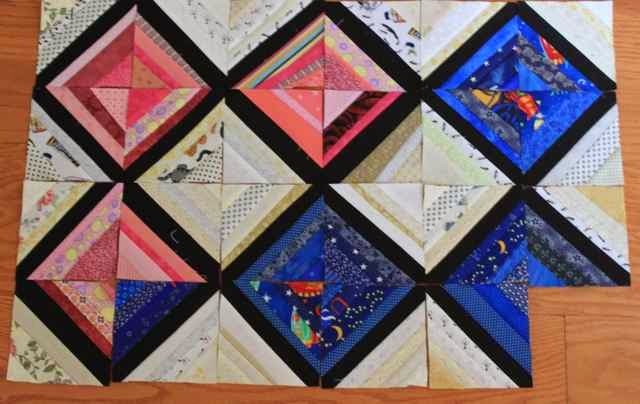 Kathy did one a couple of years ago with 1.5 inch blocks, but these look like 2 inch blocks? I could really see making some of those. 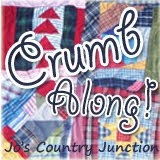 Crossroads is always a favorite too, Connie at Down by the River has a great tutorial for making it in 3 different sizes. Look at the sampler blocks, the directions are all on the RSC Sampler tab! They look fabulous. And the flowers at the bottom? Too cute. Thanks so much for Dot for sharing her progress. 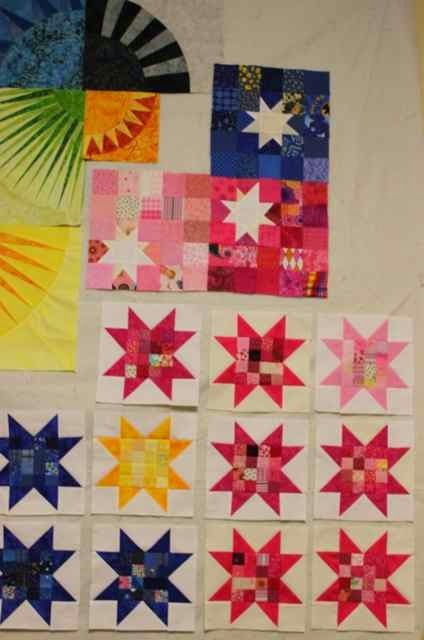 I love it seeing what you are all creating with your scraps. Today was the first day I've had to really enjoy yellow. Thanks to my new iron, I was able to finally finish off the postage stamp stars. While I was finishing things off, I framed out the rest of the nine patches for the framed nine patch quilt. 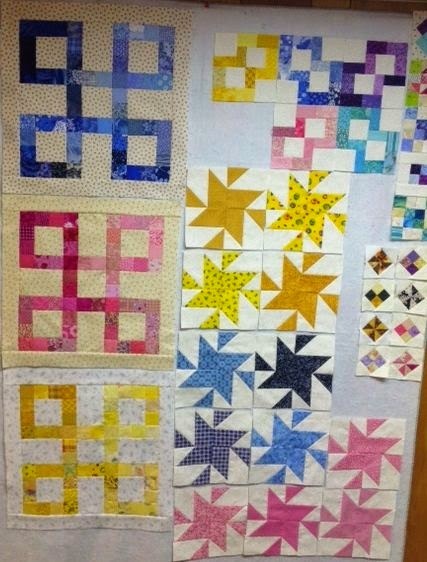 Then I dug up enough 2.5 inch squares for a white star on yellow background. That just left the string blocks, I would have liked to make a few more, but I'm just about out of yellow strings. Yay me! It felt so good to have a day to enjoy sewing! I still had time after all of that, and cleared out the yellow to get a head start on next month. Nothing done yet, but it was fun to start seeing a new color. 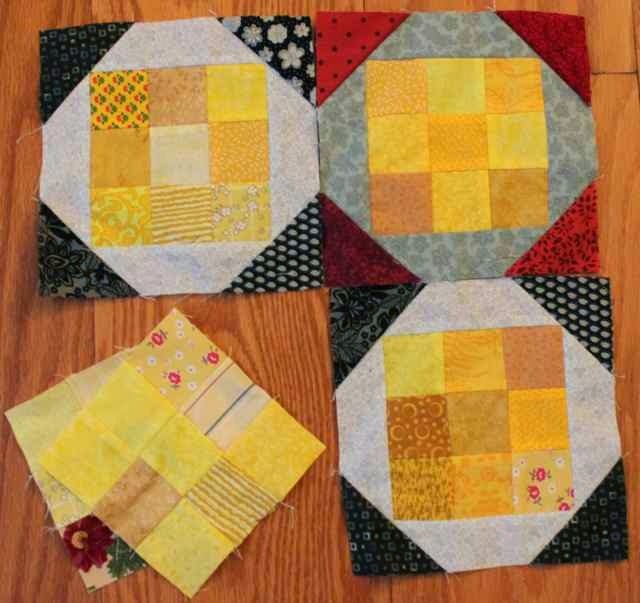 Oops, just remembered that I forgot the yellow 2.5 inch squares for the alternate blocks in the sampler quilt. That will be next on the list. Home days are awesome! Almost forgot to mention the 6 loads of laundry, power lifting and grocery store. Now, time to put up my feet and watch a movie with the kids. Dad brought home Big Hero 6, should be fun. It is Wednesday of our spring break week, meaning the fun is almost half over. 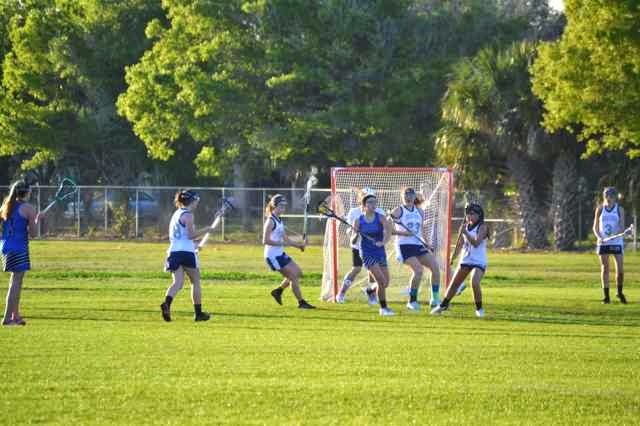 Here is Sydney at Lacrosse. I'm sure she's in there somewhere. 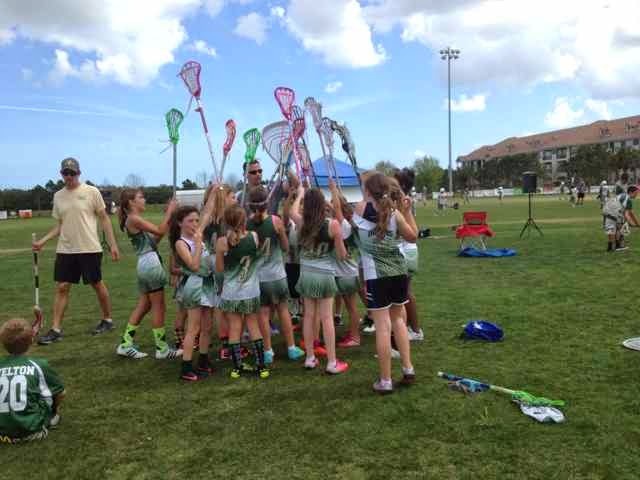 Here is Anna at Lacrosse. Kurt had to take her while I was with Ryan at Mathcounts. 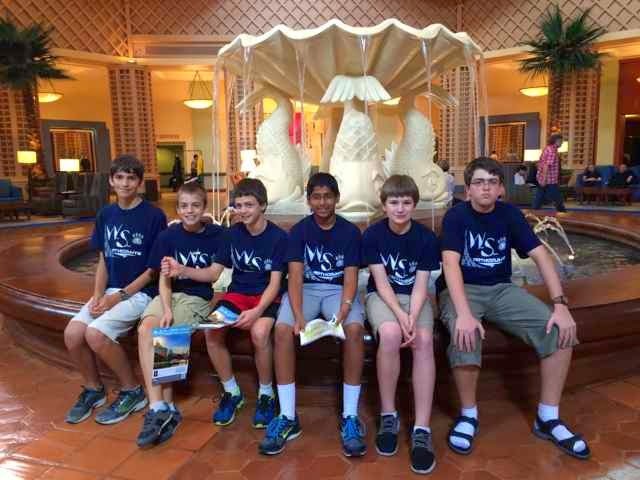 Here is Ryan at Mathcounts. It was at the Disney Swan and Dolphin Resort this year. Probably nicer than the Doubletree of last year. 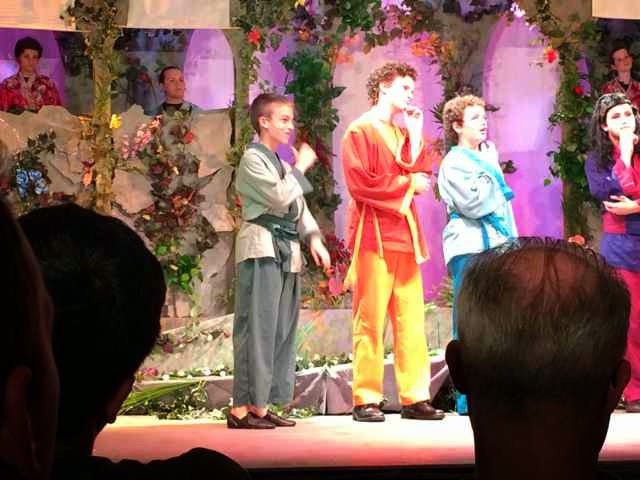 Ryan had to miss the daytime performance of the school play, but we got back just in time for the evening show of Mulan Jr. He had a super time and was all excited about going to Steak and Shake after. Then bright and early the next day, I was up to take Anna to the Orlando Science Center. I forgot to take any pictures during, but we had ice cream and bowling afterwards. River wasn't in the competition, but he came to be supportive. 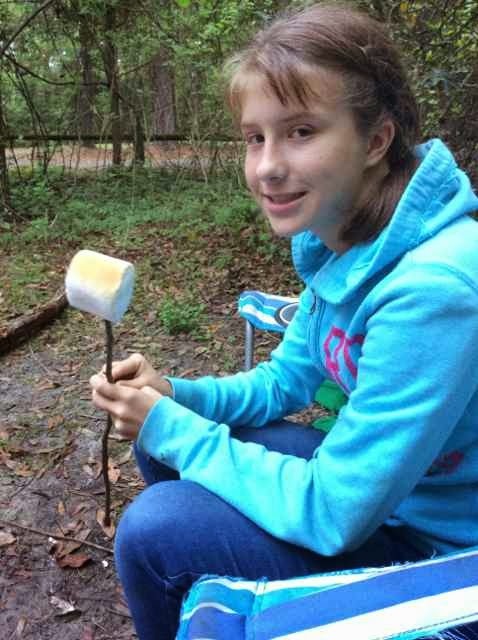 Then, finally, we were able to start the actual spring break activity -- camping! Day one started with hiking. 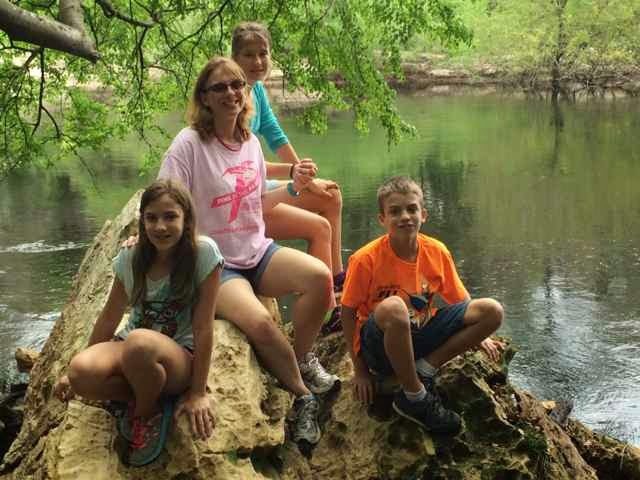 Here we are on balanced rock, which isn't quite so balanced as it used to be. Each day ended with 'smores of course. So many 'smores! Every meal was cooked over the fire. We all smell like smoke now, but in a good way. 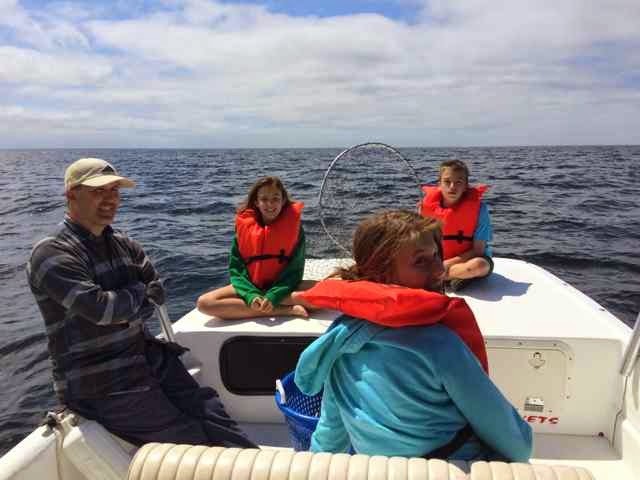 We took a break from the camping to take a boat out on the gulf, no fish were caught, but it was lots of fun. And so now we are home again to rest up from our vacation. While the laundry works its way through the cycle and the kids settle back into home again, I think I'll go remember how my sewing machine works. It is spring break! Bring on the sunshine. It hasn't quite sunk in yet, but I am planning at some point to sew a little bit. Hope you enjoying your yellow. Mine are all a bit in flux, but hopefully a bit of home time will cure all that. 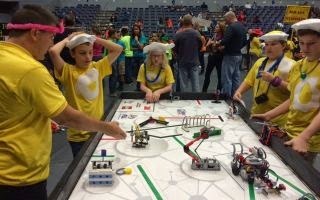 Our spring break send off had State Mathcounts, school play, Lacrosse and Orlando Science Challenge all happening simultaneously. We are almost through all of that though and ready to enjoy a bit of calm. 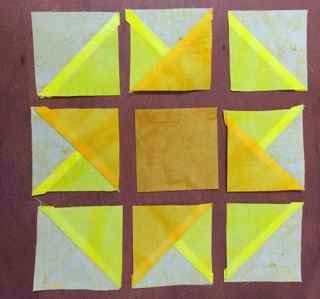 I hope to post the alternate blocks directions for the yellow in the Sawtooth Sampler quilt. But for those cleaning up, it looks like you will need 18- 2.5 inch squares. 6 of them will be sewn into four patches. I'll sew mine up after I get back from Orlando tonight. 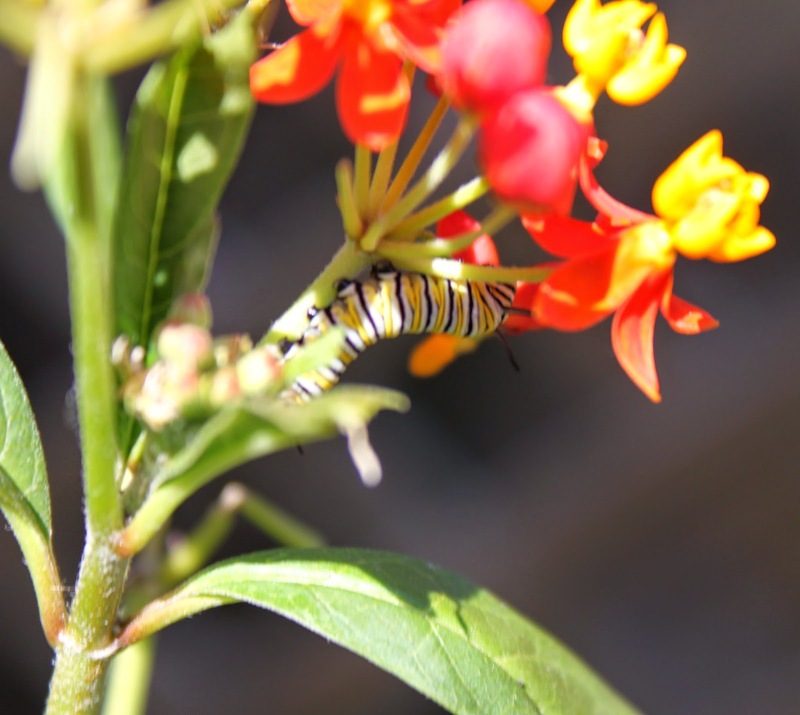 I got some milkweed at a butterfly garden session while I was at my science teacher convention earlier this year. Look who moved in! Aren't they sweet? 7 caterpillars are munching away at the leaves. 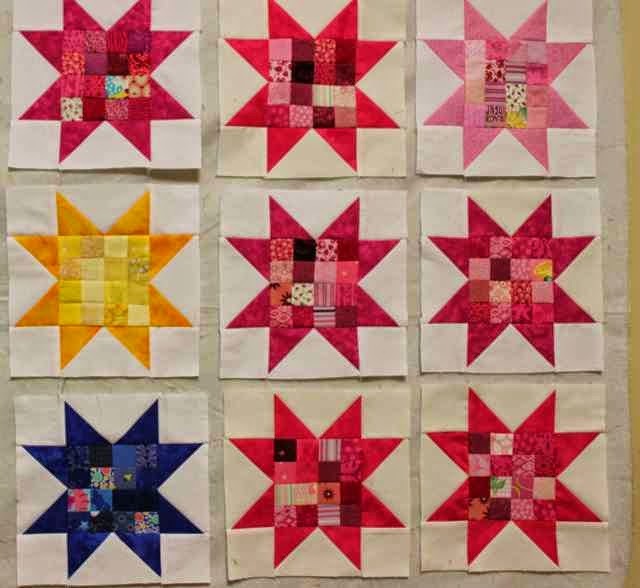 How do you stop a quilter dead in her tracks? Break her iron of course. My iron has been temperamental lately, but yesterday after getting back from a meeting for school, I was so sad to find that my iron was completely dead. So sad! I think I can get a new one on my way home from academic team tonight. So sadly, there were no more yellow blocks to add to my design wall, though many are in progress. What's on your design wall today? Will be turned into more of these postage stamp stars. 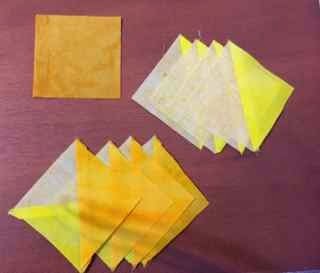 Hopefully I will also be able to run out to the post office to send off some of Vicki Welsh's yellow hand dyed fabric to the lucky winner. Thanks to Random.org, for choosing the lucky winner..... Heather who blogs at Peachy Pages. So, Heather, if you will send me your snail mail via e-mail, I will send your fabric right away. There are lots of variations on the Monkey Wrench block, which is just another variation of the Shoofly. This one has slightly modified measurements to make it work nicely in a 6 inch size. The corner units are HSTs cut from 3 inch strips. 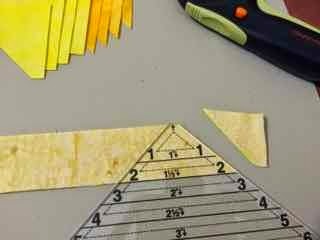 Place strips of dark yellow and background together and use the easy angle ruler to cut 4 units. 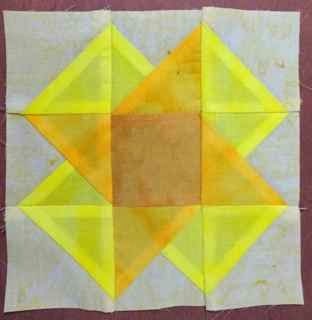 From the same dark yellow, also cut a single 1.5 inch square. 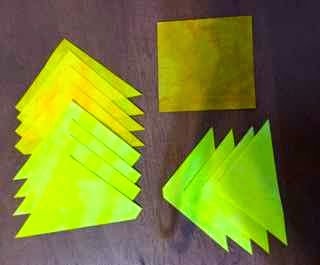 From light yellow cut 4 - 1.5 by 2 inch rectangles. From background fabric, cut 4 - 1.5 inch squares. 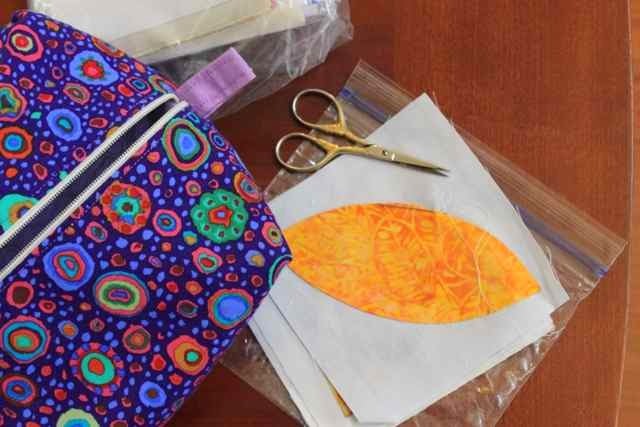 Sew the HST units along the hypotenuse. 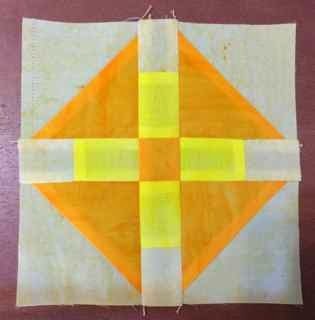 Then sew a background square to one end of each light yellow rectangle. After the subunits are pieced, it is just another nine patch. Press away from the triangles and toward the center of the block. I find that this helps my points come together better. Your block should be 6.5 inches so far. Finally, add the star points to your block, using the tutorial posted here. With the cold and snow that seems to be the norm in the northern US these days, I thought we could all use a bit of sunshine. Yellow can be one of those colors that overwhelms on its own, but combined with other colors, it adds such a great sparkle and lightness. 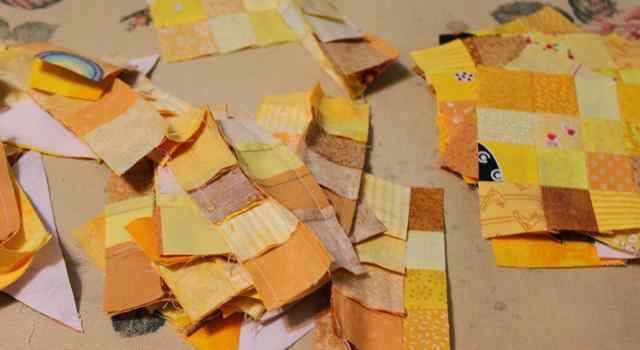 So go dig out your yellow scraps and get ready for some sunshine! I was pleased to find my pink bin of scraps nicely organized and fairly wrinkle free. They were even sorted into squares and strips and crumbs, all ready to be put to use. I think that framed nine patches are first on my list this month. 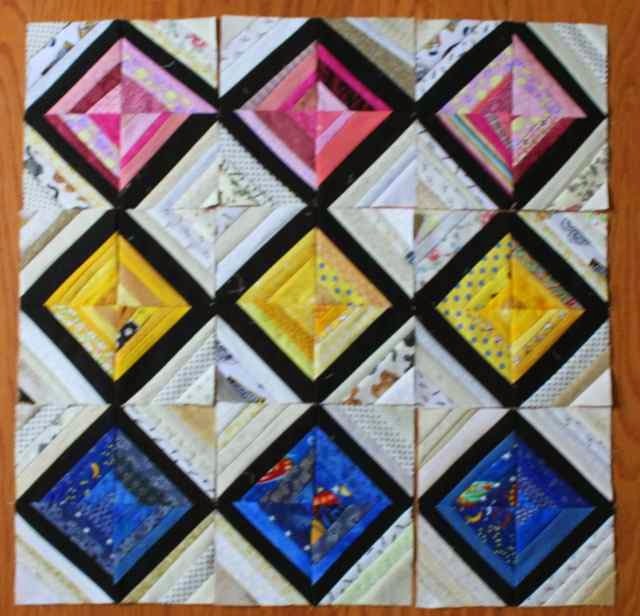 I stuck some two inch squares into the leaders and enders stack toward the end of the month and a few have already made their way out. Next up will be some churn dashes to alternate with these yellow baby nine patches. What are your plans for the yellow month? Use mister linky to share with us all. Don't forget to enter the free fabric giveaway! I'll be drawing tonight, so follow this link if you haven't joined in quite yet. The Air Castle block is very similar to the Card Trick block from January, but with a solid center that feels more "star-like" to me. Both 2.5 and 1.5 inch strips are used in this block. The 1.5 in strips will be used for the quarter square units, while everything else will come from 2.5 inch strips. 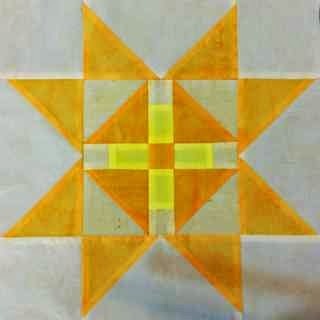 I chose a third yellow for the center, but it could also be made of background fabric or a repeated color. 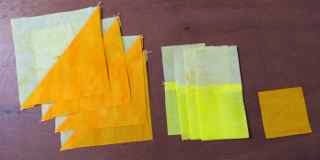 Whatever yellows you choose, try to get a variety of shades, from pale or buttery to darker or brighter golds. Start with the 2.5 inch strips. 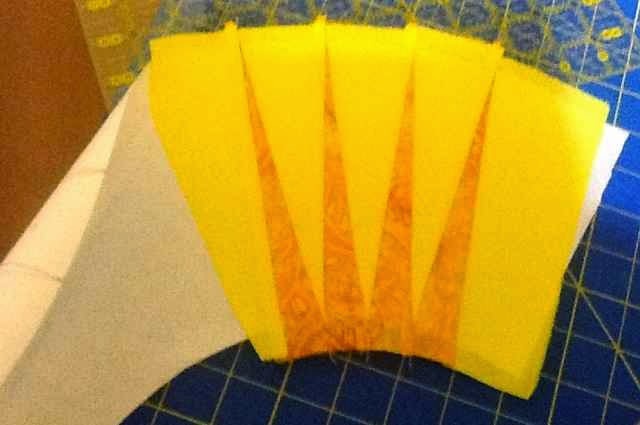 Pair light yellow with background fabric and use the easy angle ruler to cut 4 HST units. 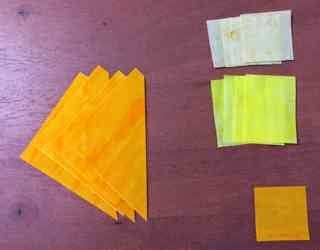 While you still have the easy angle ruler handy, also cut 4 HST units out of the darker yellow. 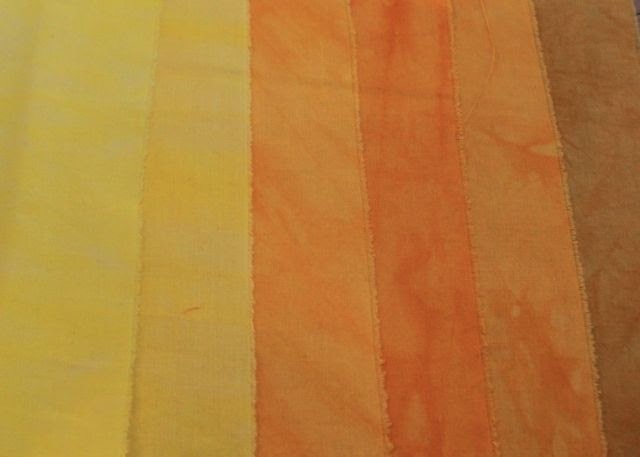 Now layer 1.5 inch strips of background fabric and light yellow together. 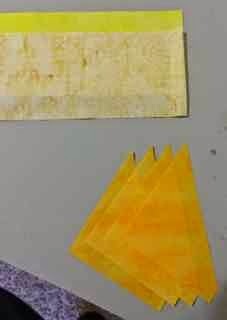 I used the same light yellow for the bigger and smaller triangles, but it could be different yellows as well. Now use the companion angle ruler to cut 4 QST(quarter square triangle) units. 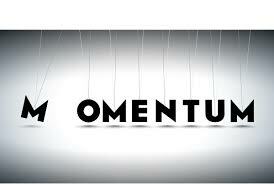 Start with the QST units. They get sewn together on a short side and NOT on the hypotenuse like the HST units. Just make sure they all get sewn on the same short side. 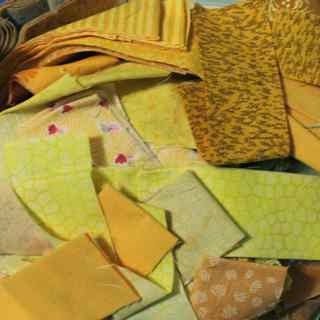 Press carefully toward the yellow fabric, being careful not to stretch out the long side which is on the bias. Next, sew the HST units together along the hypotenuse. These are symmetrical, so you don't have to worry about the orientation. 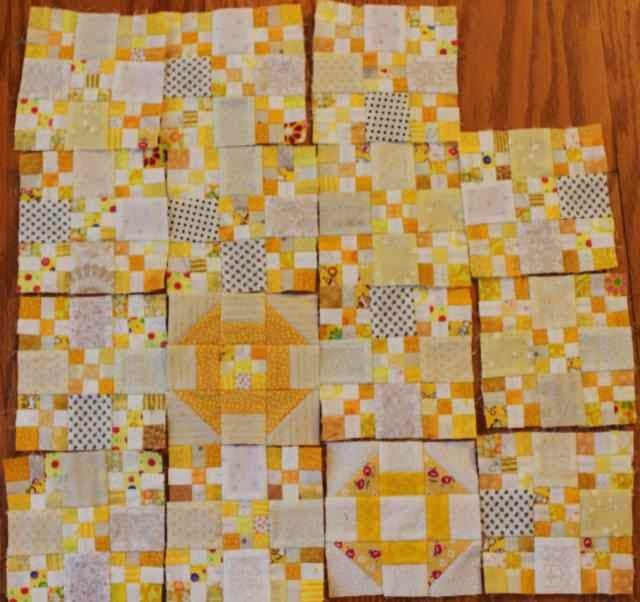 Next, pair the QST subunits you just sewed together with the dark yellow HST pieces. 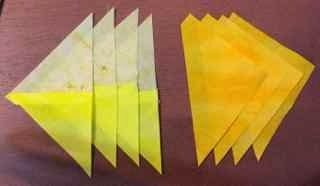 Sew these along the hypotenuse and press toward the dark fabric. All the subunits are now ready to go. They should all be 2.5 inches unfinished. From this point, all you have to do is arrange your blocks into a nine patch. The solid square forms the center, the HST units form the corners, and the QST units are the edges. Check the photo to make sure everything is facing the right way. Here is your block. It should be 6.5 inches unfinished. 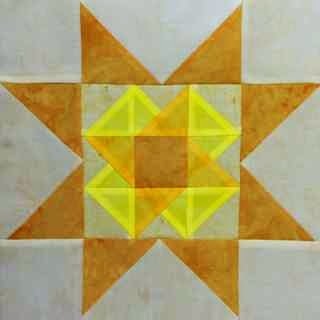 To finish, just place the block into the center of a sawtooth star block using the tutorial found here. In celebration of the end of the pink month, I finished off these pink strings. I am REALLY liking the way this quilt is starting to come together. I might need to do some math though and think about how many blocks it might need, because I don't seem to be running out of strings yet. 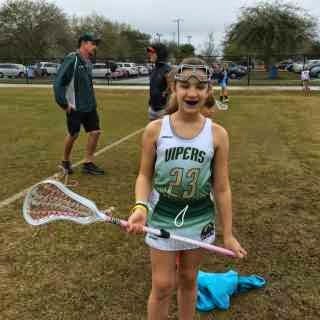 Kurt took Sydney to Lacrosse yesterday. It was a cold and rainy double header. Poor Kurt, he got the short straw on that pick. Sydney was horribly insulted that the uniform has a skirt. She doesn't think skirts are the right choice for sports. 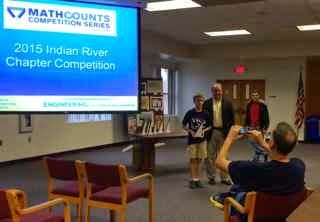 I got to take Ryan to mathcounts. It was inside. He finished third in the district and is headed on to state right before spring break. I got to watch them all do math while stitching away on my orange peels. The last of the pinks are done, and so I started in on the yellow. So bright and sunny for spring. 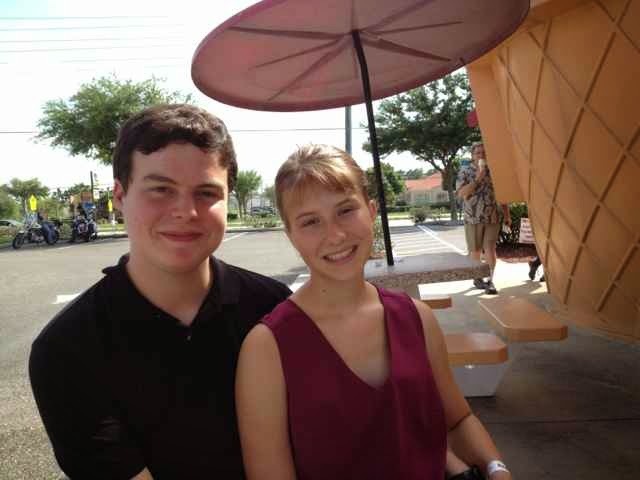 Then last night I took Anna to see the school play, her boyfriend was in the band. Then afterwards we all went out for a very late dinner. It was midnight by the time we were ready to drive home. I was sure I would be able to sleep in this morning, but I was up by 6:30 and ready to get in some sewing time. Today should be a nice home day, I'm supposed to help Anna with a paper for school and take both girls out to buy some shorts for spring. Other than that though, I will be spending some nice relaxing time with needle and thread. 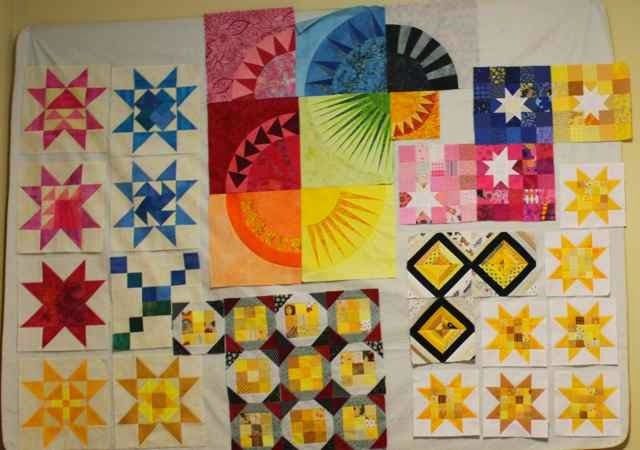 If you are feeling like a nice relaxing Sunday, be sure to head over to Kathy's Quilts to look at slow stitching Sunday. 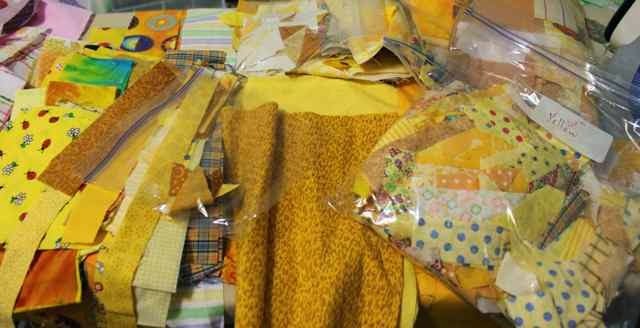 Don't forget to check out my last post if you would like to enter the drawing for the March yellow fabric giveawy. The color for March will be yellow. 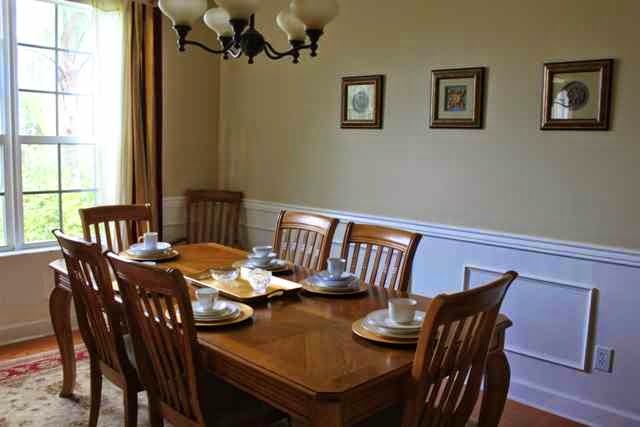 Yellow is one of those colors that can be a bit overwhelming in very large quantities. As an accent though, it adds brightness and contrast that can be really lovely. Try to work in the entire range of yellows. 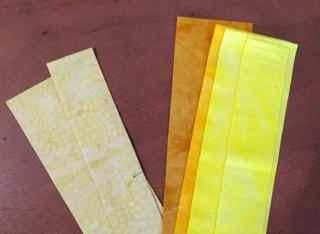 Remember that you can go from delicate and buttery yellow all the way to deep golds. Notice how the hand dyed fabrics from Vicki Welsh cover an fabulous array of shades? If you would like to win this fabric collection, simply leave a comment on this post with the one thing you are most looking forward to about spring. Mine is spring break.